This Whole30 mustard potato salad is a family favorite. My Nana gets all the credit for it, but I tweaked it to make it totally Paleo, Whole30 and dairy-free! The pickles and yellow mustard flavors are one I always look forward to. I love making this potato salad in the summer for parties or meal prep, and I think it only gets better the longer it’s in the fridge! I’ll be honest. I am not a huge fan of hardboiled eggs. In fact, I won’t eat them on their own. Except for when they’re in THIS Whole30 potato salad. The flavors from all of the other tasty ingredients just somehow come together with the eggs and they work their collective magic and make me forget I don’t like hardboiled eggs. Maybe it’s because I grew up eating my Nana’s salad, before I knew I didn’t like hard boiled eggs, who knows. I know this recipe looks like a lot of work, but I promise you it’s not. And, well, even if there’s more than a few things that goes into it, it’s SO worth it. The pickles, seasonings, veggies, all necessary to make this the best Whole30 potato salad ever. What I love most about this is that when my boyfriend tried this recipe after I had done my “Whole30-fying” of it he didn’t recognize too much of a difference between mine and my Nana’s! It was a huge win in my book. 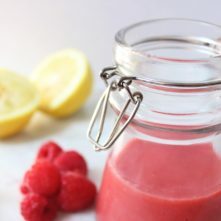 However, if you are wanting to make this a little more traditional, but still keep it Paleo, you can add 1 tablespoon coconut sugar into the mayo mixture. I prefer to chop the pickles, eggs, red pepper and other ingredients really finely instead of in bigger chunks. You can totally leave them larger if that’s your preference! The smoother, creamier consistency of this Whole30 mustard potato salad is something I really enjoy, but no judgement if you want to change it up! I also tend to cook the potatoes a bit more so that I can almost mash them, but not quite mash them. 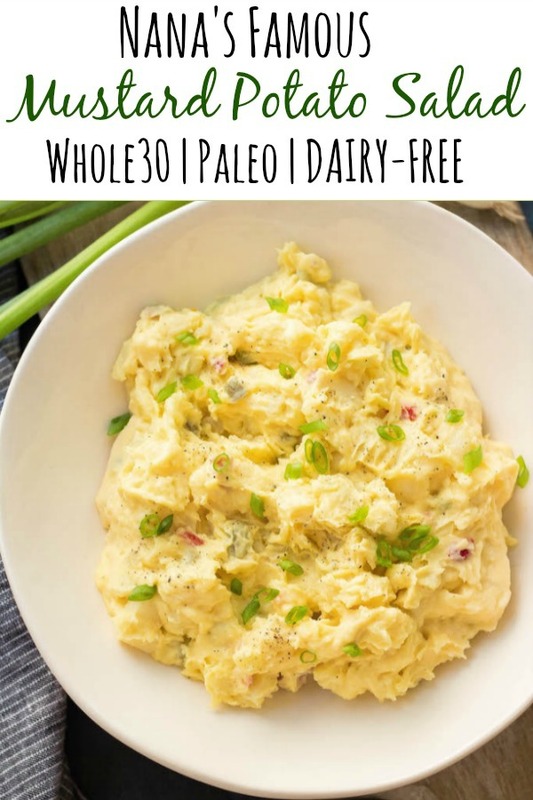 One way to customize this Whole30 potato salad to your liking, or to experiment with a different flavor is to use relish instead of pickles and add a bit of celery seed. The Whole30 Approved mayo I recommend for this is from Primal Kitchen. You can get it in many Whole Foods, from their website, Amazon, or Thrive Market. You can also make your own quickly and easily too! Check out my Whole30 Southwest Potato Salad if you wanna spice things up! This Whole30 mustard potato salad is a family favorite. 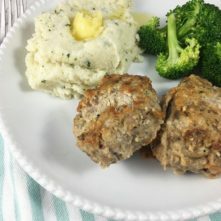 My Nana gets all the credit for it, but I tweaked it to make it totally Paleo, Whole30 and dairy-free! The pickles and yellow mustard flavors are one I always look forward to. I love making this potato salad in the summer for parties or meal prep! Bring a large pot of water to a boil. Add potato cubes and 2 teaspoons of the salt. Cook for 10-12 minutes until potatoes are fork tender and able to be mashed with a little resistance. Drain and set aside. While the potatoes are cooking, add all other ingredients to a large bowl. Mix well to combine. With a fork or potato masher, lightly mash the potatoes so they’re slightly creamy but still semi-formed. Gently fold into the large bowl with the vegetables and mayo mixture. Combine well, garnish with green onion and additional salt and pepper to taste. Refrigerate for 2 hours prior to serving. 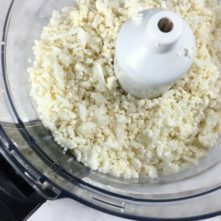 If you choose to grate the onion, grate it directly into the bowl you’ll be mixing the mayo in to keep the onion juice that’s released during the grating process. Gently mashing the potatoes helps make the potato salad creamier and let’s the potatoes absorb more of the flavors. 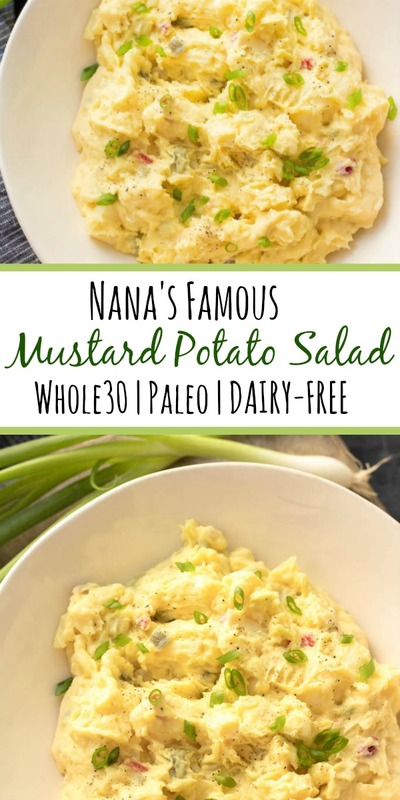 This Whole30 mustard potato salad post may contain some links that are affiliate links, though products are ones I use personally and recommend. When you purchase anything using my links, it costs you absolutely nothing extra, but it does give wholekitchensink.com a little financial support which helps to keep this blog running. Thank you for your continued support, both with your dollars and your interest. Made this salad last night and my family absolutely loved it. 5 stars all the way!! Yes! So good! I made this for dinner tonight, going to serve it with dry-rubbed grilled wings and grilled veg. I also am so happy to discover that DILL PICKLE RELISH is a thing! I hate sweet relish and found some dill…and it’s ecerythkng I never knew I needed. 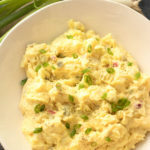 This potato salad would be a great stealth addition to a non-whole30 bbq. Love it. This potato salad was amazing! I would have no idea it was whole30 either if someone else had made it for me. My husband couldn’t get enough of it. Totally a keeper! Oh my gosh!! Thank you! This made my day – so glad you love it!! Made this last night for the second time! Loved it even more! Never would have thought something that tastes this good can be good for you! My boyfriend had a huge bowl and loved it! Thank you and keep up the great work! ???? Love to hear it! Thanks, Michelle! I’ve tried alot of potato salads from alot of whole30 bloggers… so i can say hands down this one is the best!! Will be making over and over! Wooo! High praise! Thank you so much! Awesome! I’m SO glad to hear that! Thank you!! Served this with dry-rubbed, grilled pork ribs. My family of 5 (including 3 teens) loved, loved, loved this. 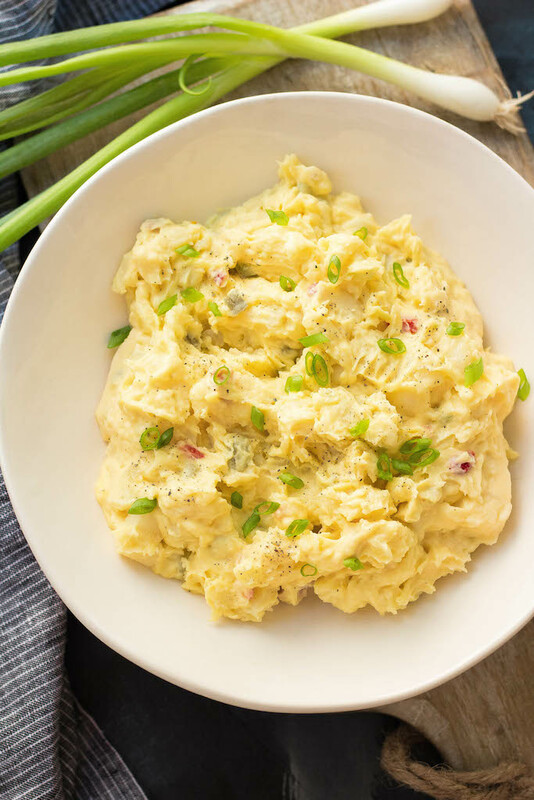 It is reminiscent of the mustard-based potato salad I grew up eating in the Piney Woods of east Texas without the overpowering sweetness, and general non-food ingredients, of Miracle Whip and sweet relish! I especially love how the creaminess of the potatoes and egg is balanced out with the crunch of the veggies. One comment: It would be helpful if you would include the green onion in the ingredients list. With online recipes such as this, I generally go straight to the recipe, assess it and either move to another, save it, or write down what ingredients I don’t have on hand. The recipe was still delicious without the green onions, by the way.